Posted: Fri Nov 10, 2006 3:42 pm Post subject: How did they do it? My main interest in ancient Egypt is how on earth they managed such amazing feats of stone working and moving. As an example there is the unfinished obelisk at Aswan, It split while being cut from the rock and was abandoned. If they had managed to cut it out, it would have weighed around 1,200 tons! How on earth do you move a 1,200 dead weight? It would be very difficult even with todays technology and equipment. They obviously thought they could have moved it, or they would not have started work on it. If someone could offer any explanations I would love to hear them. It's true, the Egyptians managed the most amazing feats of engineering with simple Bronze Age technology. They had the minerals and other natural resources for nearly everything they needed (for building materials and tools), and of course a large population of young men to serve as laborers. The obelisk, once freed from its granite embrace, would've been manhandled onto a series of sledges and hauled to the Nile. Log rollers placed at intervals underneath the sledges would've assisted in the move (the same sorts of rollers have been found in the remains of collapsed ramps at the ruins of unfinished pyramids). Once at the river the obelisk would've been loaded onto a barge, at a quay. From the reign of Hatshepsut we have reliefs showing the transport of obelisks on barges. It was probably only once the obelisk had been raised at its destination, that craftsmen would've carved the inscriptions and vignettes onto the four sides. As you say the unfinished obelisk is still attached to the bedrock, I have never seen any explanation as to how it would be possible to undercut and free the obelisk. As you know the obelisk is of granite, copper or bronze tools will not cut granite. I am supposed to believe according to modern day archaeologists that the Egyptians cut the trench all around the obelisk using stone hammers. I might not be very bright but I'm not dumb enough to believe that! I have several pictures from the net which show vertical grooves down the side of the trench, almost like it was machine cut. I am supposed to believe according to modern day archaeologists that the Egyptians cut the trench all around the obelisk using stone hammers. I might not be very bright but I'm not dumb enough to believe that! I have several pictures from the net which show vertical grooves down the side of the trench, almost like it was machine cut. I was under the impression that the ancient Egyptians pounded the granite with dolerite. When using bronze tools (saws and chisels), they added sand as an abrasive to work the granite. Also, they used wedges made from wood that they soaked to break the granite from the bedrock. The fact that the ancient egyptians were able to work with hard stones ever since the 2nd dynasty has been a source of amazement. There is some uncertainty as to the tools used during the quarrying of hard stone. 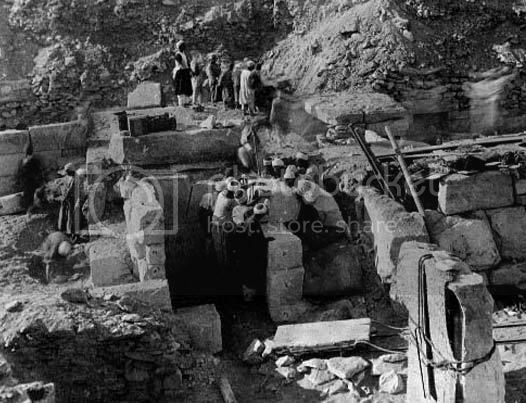 The unfinished obelisk at Aswan shows that as many as 50 workers were working around the obelisk and that the depth of their trenches was periodically assessed by overseers. There are apparently still marks (red triangles) along the side. It was once thought, based on long sequences of wedge holes at the quarries, that granite was removed by inserting wetted wooden wedges into the holes. This theory has now been discarded and is though to be unlikely. Experiments in the 1980's and 1990's by an egyptologist named Denys Stock, have shown how the granite could have been worked though. Regular copper tipped tools would have worn away to quickly, but apparently the addition of (quartz) sand creates enough friction to give their drill enough power. So it may very well have been that the addition of some sand and water would have allowed them to use copper tipped tools to do the actual work. So I think it may have been straight forward egyptian ingenuity that solved the problem. Kidding. Really, those grooves actually look too rough to be cut by machines. Yes, I am 'dumb' enough to believe that they used primitive tools like stone hammers to cut extremely hard rock-with a lot of time and patience, which the AEs had, it can be done. I don't understand how wet wooden wedges would work though. Isn't wood-especially wet wood-much too fragile to use to break granite? It would splinter if pounded into a granite gap wouldn't it? or am I just being dense here? The two objections to the wooden wedges theory are that they almost certainly would not have had the strength to fracture granite. Another objection seems to be that the wedge holes all date to the period after Ptolemy II. The evidence from the earlier period points to the use of stone pounders (dolerite, gneiss, or basalt) to remove the stone from the quarries and then using the copper tipped tools with sand for further work on the objects. Maybe they also used the sand to create more friction while pounding? The lifting of the obelisks was most likely done by pulling it horizontally and then removing it. Really, those grooves actually look too rough to be cut by machines. Yes, I am 'dumb' enough to believe that they used primitive tools like stone hammers to cut extremely hard rock-with a lot of time and patience, which the AEs had, it can be done. The evidence seems to strongly point that way. I thought the lifting was done by pulling the obelisk up a sand mound, letting it lie horizontally with the bottom end oriented towards a hole in the ground where it would be placed...then the sand would gradually be removed from the underside so that the obelisk gradually slants upwards to vertical and fits in the hole, and people would help push it into place. I could be wrong about some of those details but I'm sure about the sand mound bit. As you say the unfinished obelisk is still attached to the bedrock, I have never seen any explanation as to how it would be possible to undercut and free the obelisk. As you know the obelisk is of granite, copper or bronze tools will not cut granite. Anneke argues against the wooden-wedge theory (if you haven't already read that) but I personally still find it credible. As I explain in more detail below, there is ample evidence for this technique in the quarries of Giza, dating to Dynasty 4. I can't say for certain if it was used at Aswan, though, because I haven't really studied the unfinished obelisk in as much detail as I've studied pyramid construction. Copper and bronze will cut granite, just the same as the Egyptians used these materials to fashion door lintels, sarcophagi, and other pieces crafted out of granite. They did the same with quartzite, which if I'm not mistaken is even harder than granite. The tools would wear out, but there was no problem producing enough in quantity to get the job done. The Egyptians did it time and again. As anneke also explained, sand was used with these tools to produce greater friction (this was how Egyptian saws worked, as well). And diorite, an extremely hard stone, was a ready resource for the production of very durable pounders. The Egyptians would've undercut the obelisk from both sides until it broke free of its own weight. Given the enormous stature of the unfinished specimen at Aswan, you can imagine how dangerous that part of obelisk preparation must've been! I'm not so sure about that, though. I can't say with authority that this was absolutely how it was done at the Aswan quarry, but these wedge holes have been found in the Dynasty 4 quarries at Giza. The object was to create a line of intermittent wedge holes, which would consequently weaken that whole plane of the rock. As I understand it (at least at Giza), this was one of the last procedures in removing a block of stone from a rock face, and the wedge holes were positioned along the bottom (the three other sides had already been cut deep into the rock face). With enough whacks of the wedges the bottom plane of the block would fracture and the rest was then more easily worked free. Again, I don't know the veracity of this technique with the unfinished obelisk at Aswan, but it does go to show that it was used all the way back in the Old Kingdom. I guess I can't know for sure myself unless I perform a test, but there aren't many rock faces in Chicago with which to experiment, and the city really frowns when you do this sort of thing to their concrete skyscrapers. In any case, this was similar to at least one technique in the manufacturing of the sarcophagus trough. Holes were drilled at regular intervals in lines down and across the top, and then the interconnecting remnants of stone were chiseled away. It must have been quite laborious but this process was continued level after level, deeper and deeper, until the desired depth of the trough was achieved. Isn't wood-especially wet wood-much too fragile to use to break granite? It would splinter if pounded into a granite gap wouldn't it? or am I just being dense here? I imagine the wooden wedges would be wrecked often enough. But so would the copper or bronze tools, as anneke mentioned. This was assembly-line engineering and there would be teams of craftsmen employed especially to repair and produce tools. Wood was scarce in Egypt but even stout stunted trees can be used for mallets and wedges. 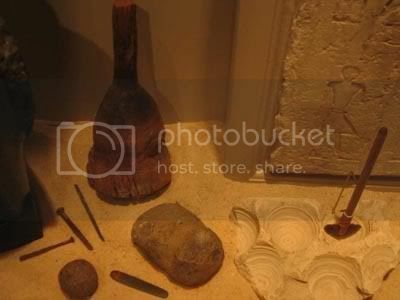 Most of the mallets were made of wood, after all, and these were how the Egyptians pounded their chisels into the rock. I imagine they went through an awful lot of mallets, too. I thought about mentioning that part of the process in my original reply to RogerC, but thought he was inquiring only about the cutting end of it. I'm glad you added this information. I certainly agree-most Egyptian copper tools would have not lasted very long at all with such tough rocks, but they were easily replaced and mass-manufactured for this purpose. For softer rocks like limestone it would have been easier to cut and chisel but the tools would still be worn away fast-and replaced by willing servants when needs be. They were very organised when it came to such matters, no need for any complicated hi-tech stuff here. I think the drills used for the holes were manually worked copper tubes, made rougher by sand? I saw this demonstrated on TV and the process worked very well. I've heard there's only one type of stone which is harder than diorite which was used for the cutting and maybe carving of this rock? When wood was wedged into the stone and then became wet, it expanded to crack the stone, I think. What I've studied of the wedges didn't require them to be wet, although that may have been the case. The object was to fracture the block in a line so as to weaken its plane and make it easier to remove from the rock face. Note the drill in the lower-right corner. It's a wood shaft with stone drillpoint. Now, the rock specimen with the drill holes is limestone, which is fairly soft, so maybe this sort of drill wouldn't work as well on something as hard as granite; perhaps the copper-bladed drill was used for harder stones. By the way, you can also see the wooden mallet in the photo--a very typical mallet from ancient Egypt. In front of it and to the right is some sort of stone hammer, and to the left of it, that little ball is a diorite pounder. Scattered between them are small bronze chisels, of the sort for finer cutting. As I mentioned above I'm not sure whether or not the wedges had to be wet. Maybe that worked for softer and smaller stones but I don't know that it would have much effect in a rock face or in something as massive as the Aswan obelisk. The wedges were primarily for the weakening of the stone along the plane where it was being cut. Kind of/sort of on the same subject (engineering, at least), I was recently rooting through the archives online on the Field Museum intranet and came across a couple of cool photographs of the mastaba of Unis-ankh under excavation. I had to "borrow" them, naturally. This was the Dynasty 5 prince (son of King Unis) whose tomb we've reconstructed at the museum. The excavation was around 1908 and an antechamber and offering chapel were brought back to the United States (they're in our reconstructed tomb). This is a shot or workmen maneuvering the false door of Unis-ankh up a steep slope. The false door is made of limestone but was painted a pinkish hue to resemble granite. Nevertheless it's two-feet thick and weighs seven tons. This is a shot of the workmen disassembling the antechamber and offering chapel--I think, anyway. I've never been to Saqqara, of course, so it's hard for me to try to orient the features in the photo. I do know that in this location near King Unis' pyramid is a tight complex of mastaba tombs, including a twin-mastaba for two of the king's wives, so we're probably seeing the ruins of more than just Unis-ankh's tomb. I do know from people who have been there that supposedly Unis-ankh's tomb looks very much like the reconstruction in the Field Museum--minus the antechamber and offering chapel, of course. It's nice to see such interest in a difficult problem, I should point out that I have never been to Egypt so anyone who has, has me at a disadvantage. 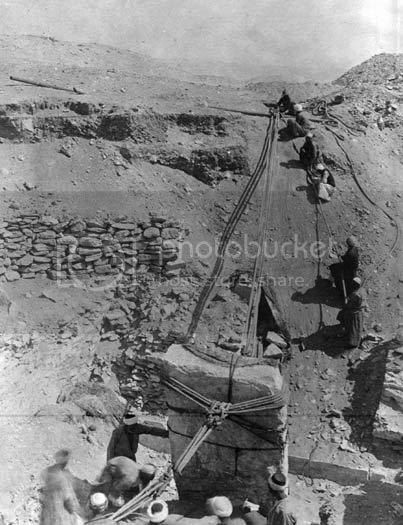 From the pictures I have seen the Aswan obelisk is level with the bedrock in it's trench. It would seem to me that either (1) they would have to remove half the quarry to be able to drag it out, or (2) they would have to lift it straight up and out of it's trench, (all 1,200 tons of it!). Either solution is difficult to believe. I still have a problem as to their method and the tools used but your replies all provide much needed information, well, to me at least. When the problem of the obelisk is solved then we can move onto the next problem which is the Apis bulls 60 to 80 ton granite tombs! Note how the rock on the left had been considerably terraced to provide working space. Other photos I've seen would seem to support what you mentioned: that the obelisk is still level with the bedrock (most of it, at least). Work never progressed to the point that they were able to do any of the underside cutting, or for that matter more removal of the surrounding rock structure. They definitely would not have raised it up and out right there, but in the above photo there really isn't that much rock obstructing it at either end. It would not have been that difficult to "clear" a path (considering what they had already gone through just to do the amount of carving they'd accomplished to that point). I've also never been to Egypt (most of us here at ED have not), so I don't know in which direction the obelisk would've been moved. The shortest course to the river quay would've been the path, though. We're just postulating theories as to method, the same as the experts do. But the tools are another matter: they are known. Plentiful examples of tools have been found and are in museums all over the world, and plentiful examples of tool usage are seen in the wall paintings of tombs. The Egyptians were a Bronze Age civilization and used copper, bronze, wood, and other stones to do what they did. We just need to remove our minds from this modern world of fancy power tools and look at it from the perspective of the ancient Egyptians (and the many, many other ancient peoples who accomplished similar engineering feats). What other solution could there be? None. LOL Like I said, we're just postulating theories. No one knows (and may never know) just how the Egyptians managed to do everything they did. For instance, we have a pretty solid understanding today of how the Giza pyramids were erected, but we certainly don't have all the answers. An equally puzzling question to me is how the Egyptians maneuvered those 80-ton granite slabs into the Grand Gallery and King's Chamber of Khufu's pyramid. No one has been able to answer that one definitively. I'm no expert on the subject I was just reporting what I read in an article by Ian Shaw. I thought it interesting that you mentioned evidence for the wedge theory at giza dating to the 4th dynasty? Shaw specifically mentioned that all instances of the wedge theory seem to date to the time of Ptolemy II and later? Unless it's one of those topicss where the experts don't agree on the evidence/interpretations (wouldn't be the first time). I enjoyed reading your info and seeing some of the images you provided kmt-sesh.